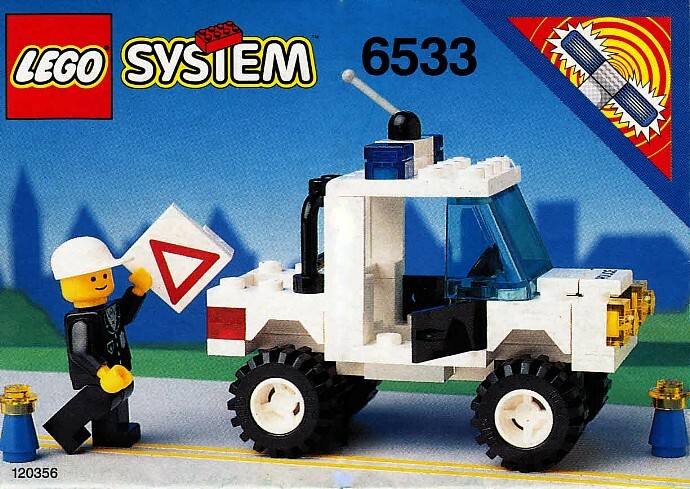 Today's random set is 6533 Police 4 x 4, released in 1992. It's one of 24 Town sets produced that year. It contains 62 pieces and 1 minifig, and its retail price was US$4.75. It's owned by 2661 Brickset members. If you want to add it to your collection you might find it for sale at BrickLink or eBay. Let's put the new 2019 light on top of this 4x4 to qualify it for the "promotional" at the top right corner! Golf course police? That’s what it looks like. He caught a crook without a “driver”s license. But the crook was a “rough” sort and “push”ed him over. Then he tried to take a “shot” at em but missed. Then he tried to follow him in his golf cart but the poor machine just went “putt putt” slowly down the road. Then he went into a (sand) trap. He couldn’t find the crook and gave him up for “lost” after five minutes of searching. I loved this set, as a kid. The white cap made this particular police officer instantly stand out, in my Lego city story-telling, and so he instantly became one of the main characters (a junior officer, like the Jimmy Olsen of my Lego city police force). He never had an office in my police headquarters, though, he was always either on patrol or hanging out in the lunch-room. Amazing the stories that flow from just a white cap, heh. This was such a good set, from a time before Town went 'Junior'. This is my era. I always admired Lego for creating similar/different vehicles with so little piece and color variety. I can still find ways to design different vehicles in classic style. That logo at the corner really confuses me. This doesn't come with a working light bar, does it? I still have this but I reckon this was one of the last sets I got back then. I love this set!! Many memories from my childhood!! Still exhibited!! I like this set. It was my second Town Police car set. Cool minifig and 4x4 car. Unfortunately the car hasn't got real shock-absorber. My rating is 5/5. I had the Police Pursuit set from two years earlier so I never really wanted this set as a kid. I thought the black doors looked weird. @T79 I think this is actually one of the sets I "purchased" with those points. You would cut out the points from the corner of the instruction booklet, go through your little Lego catalog that you might receive with some sets, fill out the form, and mail it in (probably paying for shipping.) After a few weeks you would have the set(s) shipped to you. If I remember correctly, I got this one, 6512, 6531, and 6532 this way. Oh, THAT'S what those things were for? I saw them on all my set instructions back in the day, but it never said anywhere what their actual purpose was, so I didn't quite know what to make of them. I'm hoping I can trick someone into thinking they're VIP points.